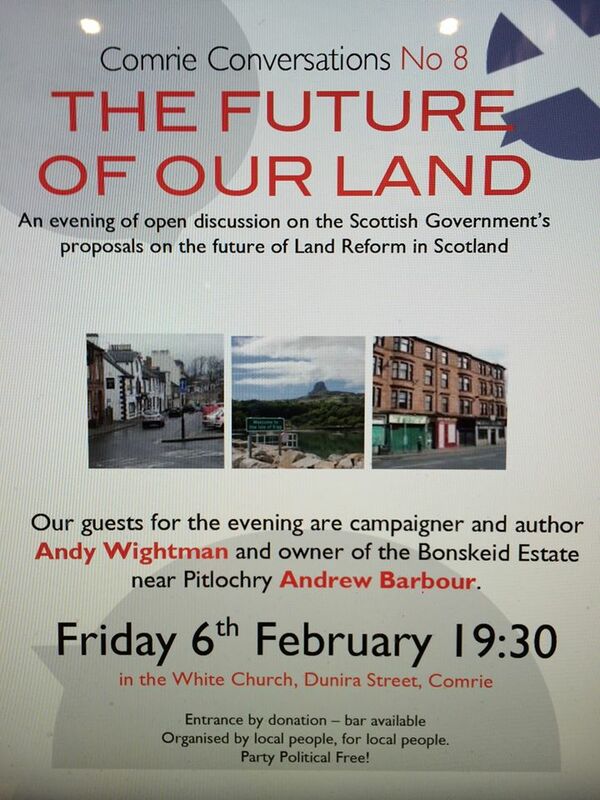 The next Comrie Conversations will be held on the 6th Feb (19.30 at the White Church Comrie). Fantastic line up for our new, post referendum format where we tackle topical issues of importance to the future of Scotland (that we have the powers to tackle). There is nothing more fundamental than the future of our land and the Scottish Government’s consultation on the controversial Land Reform plans closes the following week. 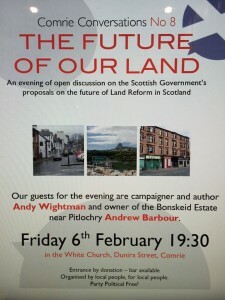 Comrie’s own Ann Petrie will be chairing a discussion between author/campaigner Andy Wightman and local (Pitlochry) landowner Andrew Barbour with the usual wider conversaton involving the whole room. Come along an hear what they agree on (if anything) and what they agree to disagree on! Usual ingredients of a bar, good conversation and good company for an enjoyable, informative evening.